Last month some of my family and friends got together at our local library for a “sew day”. I kept debating what I wanted to work on for an entire day of sewing and decided to start something new 🙂 I had a plan, and it was ambitious! I knew that if at all possible, I would need to get all of my cutting done prior to the big day. Mission number 1 was accomplished! What you see above is a ton of tiny 1 1/2″ strip sections from the red and aqua fabrics of my Little Ruby fat quarter bundle by Bonnie & Camille. I was also able to get the background fabric cut before our sewing day. It is a gray/black woven artisan cotton from Windham Fabrics. After a day of sewing with friends, I wasn’t near complete with my blocks…that’s A LOT of seams! But over the past month, I’ve been able to work on the blocks here and there and I finished putting the borders on my quilt top today. I love how scrappy it is and how it pops against the dark background. 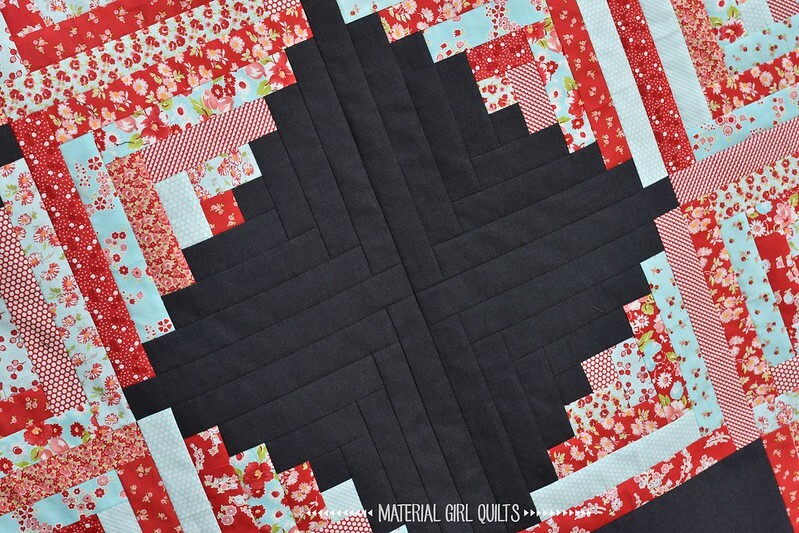 The blocks finish at 9″ and prior to adding my borders, it was 72″ square. The final size is about 84″ square now. My favorite part about this quilt top may be how the artisan cotton background looks all pieced together in the blocks below. It already has fun texture before I even quilt it! 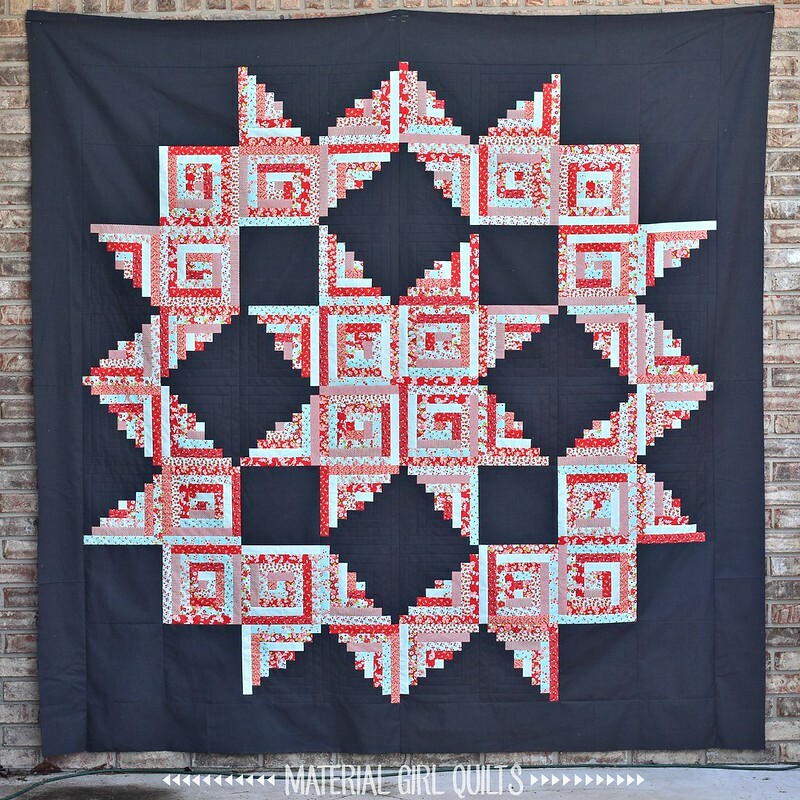 Speaking of quilting…any ideas? I’m thinking about finding an aqua backing fabric and quilting with an aqua thread. What do you think? I’d love your thoughts and ideas on this one. Aqua thread would be pretty. I love the colors and great choice of background fabrics. Very pretty! I have wanted to do log cabin blocks for a long time. This has inspired me. That turned out so pretty! 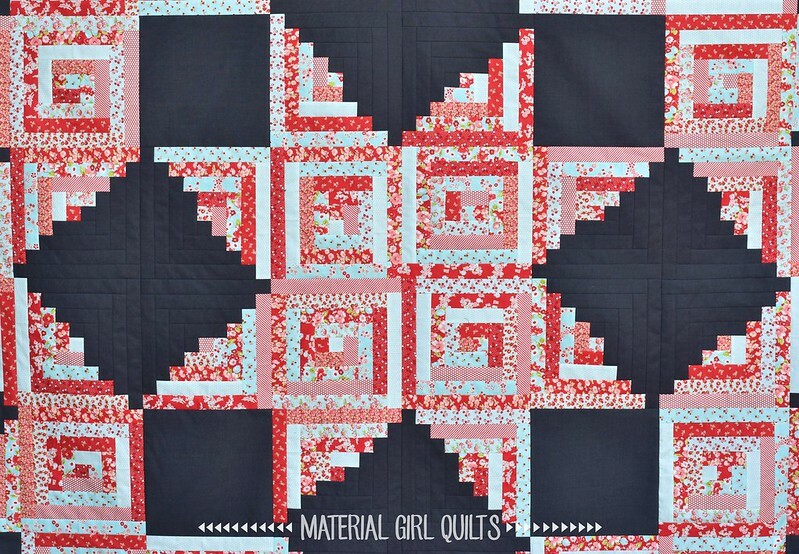 I love the Little Ruby fabrics and made the Bonnie and Camille pinwheel version – which, thankfully is now finished! Thanks for the inspiration! I really enjoy watching such works. It looks amazing.